In Washington state, the misclassification of Native Americans on death certificates underestimated opioid overdose mortality rates for American Indians and Alaska Natives by 40 percent, according to a Centers for Disease Control and Prevention study released Thursday. By comparing death certificates in the state’s registry to a database of patients seen at tribal clinics in Washington, researchers discovered many certificates did not properly identify individuals as Native. The study concluded that from 2013 to 2015, the overdose rate for American Indians and Alaska Natives was 2.7 times higher for opioids and 4.1 times higher for heroin than white residents. These figures reveal a truer picture of the opioid epidemic’s impact on Native communities in the state, previously hidden by the erroneous data. 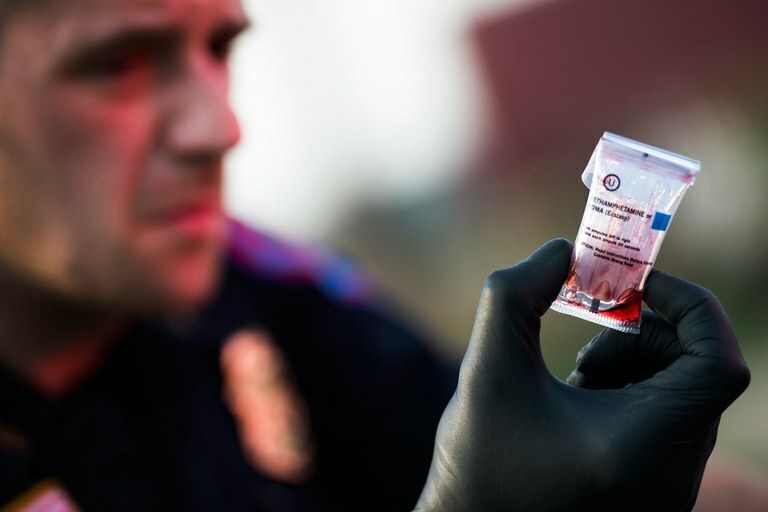 Three Affiliated Tribes police officer Jacob Gadewoltz holds a positive test for methamphetamines or ecstasy while performing a traffic stop in New Town, North Dakota in 2014. The misclassification of Native Americans is also a problem in crime data, another Washington-based study released this year found. That report, by the Seattle Indian Health Board, compiled cases of missing and murdered Indigenous women and girls and discovered numerous instances of Indigenous women identified as Hispanic or white. Seventy-five percent of the women and girls in the study lacked any tribal affiliation in the data, meaning that even tribal governments have no way to fully comprehend how the issue is affecting their own citizens. CDC researchers came to a similar conclusion in their report on substance overdoses, writing that the data discrepancies underestimate drug problems, thereby underestimating the resources needed to address them. Researchers said their findings underscore the importance of accurately recording race on death certificates. Joshi and her colleagues found that, aside from a need for greater federal funding in Native health care systems, treatment options should also be more localized. She hopes more research can help regional treatment programs emerge — ones that would “honor the history of individual communities while also addressing how things like the opioid epidemic are playing out in those communities,” Joshi said.